Another cigar that has popped up on the radar in trademark searches and on the internet is the Tatuaje Avion. The Avion is meant to be a yearly limited production spin-off of the Fausto. The Avion is slated to always be a box-pressed perfecto with the size being 5 3/4 x 48/52 this year and an additional size (5 3/4 x 48/52) added next year. This blend is supposed to be the same as the T110 and production numbers under 30,000. Translation: The English translation of Avion is airplane. Yesterday Pete decided to share a mockup of the Avion band with us on twitter. 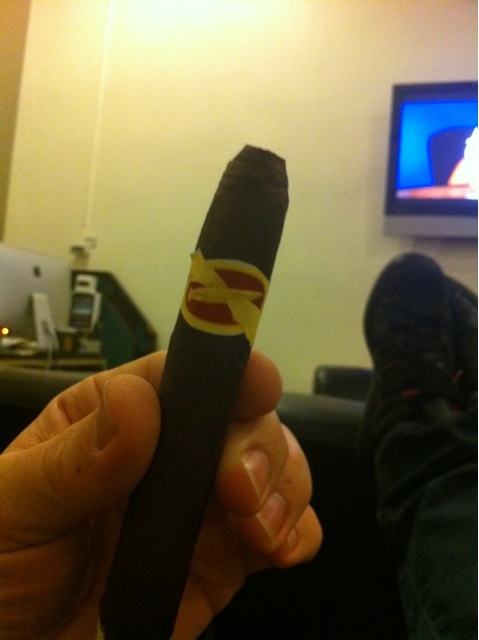 This entry was posted on March 12, 2011 at 6:41 pm and is filed under Cigars with tags airplane, Avion, box-press, boxpress, Ecuador, Ecuador Habano Maduro, Fausto, Habano, le, limited edition, Maduro, Nicaragua, perfecto, Tatuaje, Tatuaje Avion. You can follow any responses to this entry through the RSS 2.0 feed You can leave a response, or trackback from your own site.